Anyone who owns an aquarium knows the importance of keeping the water clean. In the ocean, marine wildlife has the advantage of millions of gallons of water flushing away unwanted compounds every day. As waste and other protein-based particles build up in your aquarium, a good protein skimmer is essential for the health of your aquarium. If you’re searching for the best protein skimmer, we’ve got you covered in this guide. We’ll start by looking at what HOB protein skimmers are and whether you need this type for your aquarium. We’ll also look at the benefits one will bring to your aquarium, all their pros and cons, as well as what you should look for if you intend to buy one so you know how to choose a quality product. We’ll finish up with a roundup of the best HOB protein skimmers currently available on the market today. What is a HOB Protein Skimmer? What Types of Aquarium Setups Need Protein Skimmers? What Benefits Does a Protein Skimmer Bring to a Tank? Protein skimmers come in many shapes and sizes. To make matters more complicated, they are often referred to in their own specialized categories. However, they all aim to do the same thing, which is remove unwanted proteins and waste from the aquarium’s water. These easy to install devices use air bubbles as an effective way of ensuring you end up with cleaner water in your aquarium. In essence, millions of micro-bubbles are injected into the water, in a process known as foam fractionation. A simple way of explaining the process is that dissolved organics in the aquarium stick to the bubbles before floating to the top of the aquarium. As the micro-bubbles burst, they release the organic waste in a foam which rises up the reaction chamber where it is eventually collected in the skimmer cup. A HOB protein skimmer is one which hangs on the back side of your water tank, hence the name HOB (hang on back). They can be considerably more convenient than other types, as there’s no need for a sump taking up additional space under the tank. Note: For other types of protein skimmer such as standalone, in sump and more, check out our additonal guides to the best protein skimmers in 2019, and a guide to the best nano protein skimmers. Unlike a naturally occurring reef, marine aquariums are a closed aquatic ecosystem. They don’t have the advantage of those millions of gallons of water to flush away any unwanted waste products. Research over the years has found that many substances in aquariums are far more concentrated than when found in their natural environment. The substances of main concern to an aquarium owner are the dissolved organic materials, including waste, carbohydrates, oils, and protein. If you own a saltwater or reef aquarium, a protein skimmer will be a key piece of equipment. They will only remove substances which are organic and when the foam is caused by agitation. Freshwater will not foam in the same way as salt or marine water, and a skimmer will be ineffective in a freshwater tank. Aquatic life, whether plant or fish, will continuously release organic compounds into a marine aquarium’s water. This waste can be solid or dissolved. Many types of coral produce organic waste and mucus, while algae cells will often leak internal organic fluids. Even the old slime coating shed by saltwater fish will add to the organic compounds in the water. Adding a protein skimmer to your marine aquarium, or upgrading the model you currently have, will result in improvements. Below are some of the key benefits a protein skimmer brings. Protein skimmers use a chemical adsorption process to remove organic waste. Waste materials which stick to the surface of the air bubbles are literally pulled out of the water and stored in a collection cup, which is then removed from the aquarium water. By comparison, a mechanical media filter improves the water quality by removing the waste particles from the aquarium and physically trapping them. Although you may not see any trapped waste material, it is still in contact with the water, rather than in a separate reservoir. If the physical filter media is not cleaned or regularly changed, the trapped waste can break down into pollutants, like ammonia, nitrate, and phosphate. The active waste removal process ensures mechanical, chemical, and biological filtration work more efficiently. Protein skimmers will help you maintain low nitrate levels in your aquarium, by slowing down the build-up of nitrate. Organic waste is removed before it has a chance to break down and release nitrogen compounds. The use of a protein skimmer will be essential if you require a low nitrate level, such as that crucial for coral health. With all the organic waste removed by a protein skimmer, the likelihood of algae growth is reduced. The reduction of nutrients in the water will also stop algae from blooming on any rocks you may have in your aquarium. In particular, the reduced phosphate and nitrates will help curb the growth of any aggressive algae, such as Bryopsis. The following YouTube video looks at the nuisance and hassle algae can cause in your aquarium. Organic build up in a reef tank can often cause a yellow or tan discoloration in the water. This also results in reduced light penetration to any lower reefs. Dissolved organics will absorb the blue light spectrum that many plants and fish need to thrive. Protein skimmers will promote coral growth by removing contaminants. Fewer contaminants in the water allow for more light to pass through. Your corals will be provided with a wider and more intense spectrum of the light which they need for photosynthesis. They also remove the oily residue often found on the surface of an aquarium’s water as well. In addition to the algae which grows on the glass, this oily residue can further reduce the light in your aquarium. Basically, a good protein skimmer will ensure clear, sparkling water, which shouldn’t need changing as often. The knock-on effect here is that your plants and fish will be healthier. Disease-causing bacteria and parasites absolutely love the dirty and protein-rich water of an aquarium. Harmful organisms would otherwise feed and thrive on the contaminants, but with a protein skimmer, these can be removed. The introduction of more dissolved oxygen into the water will promote proper gas exchange and a healthy oxygen level for all the inhabitants. This also creates an environment less suited to cyanobacteria, which only thrive in poor oxygen conditions. Adding oxygen to the water will recreate the oxygenated nature of a natural habitat which is important for fish survival and happiness. Some dissolved organic compounds, which other filtration systems can leave behind, will have an effect on the pH levels of your system. Some extremely high or low pH levels can affect the survival of the fish or plants in your tank. A protein skimmer removes the dissolved organics at a molecular level, to keep a stable pH level which is required by your aquarium. A skimmer can also help prevent a build-up of carbon dioxide, which results in a more acidic environment. Finally, this all adds up to less time and effort spent trying to keep your aquarium clean. Less scrubbing algae from the glass walls or rocks, less manually skimming the surface, and fewer water changes. If you should accidentally miss a water change, but you’re using a protein skimmer, your tank will be more forgiving as they help support large bio-loads which are constantly cleaning the water. There are many types of protein skimmers available on the market today, each with their own advantages and disadvantages. If you don’t have room for a sump or any space under your tank, a HOB (hang on back) model is ideal. They are easy to install and considerably more convenient than many other skimmer types. We have put together a list of our top five picks, which are our contenders for the best HOB protein skimmer available today. The first thing you will notice about the Reef Octopus BH90 HOB Skimmer is its size: it looks enormous! It features a cylindrical design with a diameter of 4 inches and a length of almost 24 inches. However, those with little space between the tank and the wall may not find it so ideal. The BH90 features a massive water storage tank and is powered by a pinwheel pump that works well on large and medium-large aquariums and tanks. A unique feature is the way the BH90 uses a siphon to feed water into the protein skimmer. This ultimately decreases the workload of the pump and makes for more air being generated. 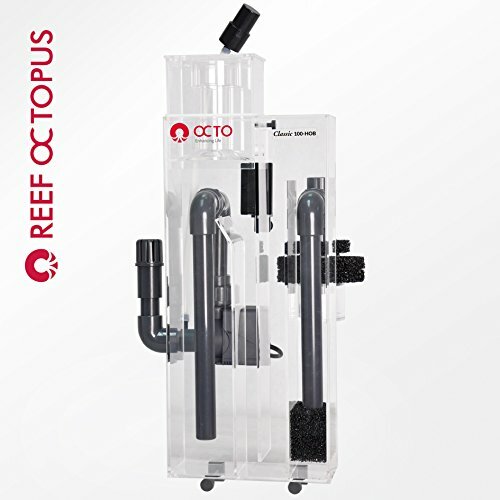 This Reef Octopus HOB skimmer is more than capable of removing the oily build up which often accumulates on the top reef tanks. 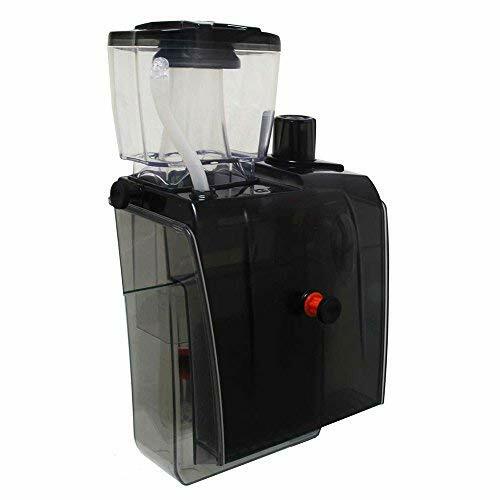 Its more efficient skimming mechanism performs better than many other models and it features a durable acrylic construction which is built to last. Footprint: 7.5 by 7.5 inches. Rated for use on aquariums up to 130 gallons. 2-year warranty on the pump. 1-year warranty on the skimmer body. Fast and versatile skimmer with a siphon for water intake. The HB90 can get relatively loud when operating. Needs a lot of space. 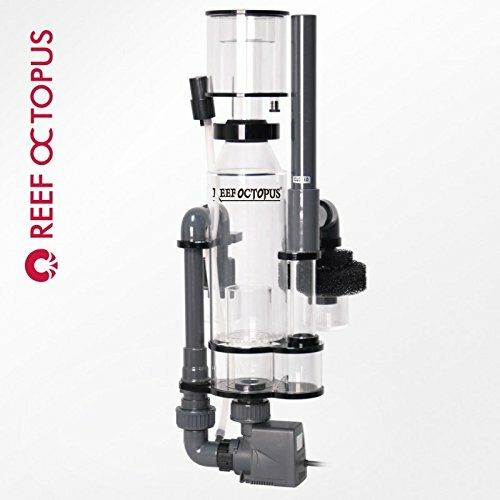 If you have a large or medium-large aquarium, the Reef Octopus HB90 protein skimmer is an ideal choice. It features a powerful yet energy-efficient pump, which will make easy work of skimming your aquarium, even the oily residue on the surface. A large collection chamber won’t need emptying too often and is easy to release as well. One thing you do need to note is the fairly large size of this skimmer, so it will not be suitable for smaller tanks. For more details and the latest prices and availability, click here. In comparison to the previous HOB skimmer, the AquaMaxx HOB-1.5 features a slimline design which is also lightweight. You could quite easily mount this protein skimmer onto a smaller sized aquarium without worrying about any structural failures. Despite its compact size, this model is rated for use with tanks up to 90 gallons with a light bioload. Many users rate it as a top model due to its powerful submersible pump and larger collection cup. Components found inside the AquaMaxx HOB-1.5 have been modified in this latest version, to boost the performance of the pump. More air is drawn in for creating an optimum sized bubble. Management of this skimmer simply requires raising or lowering the skimmer cup. The computer-precision engineered case has been designed to be easy to clean. Rated for use with tanks up to 90 gallons. Sicce Syncra5 pump uses 11 watts of power. Some users reported that it can leak more often than other HOB skimmers. Weaker construction than most because of common plumbing fittings, which may not be as durable as specialized parts. If space is at a premium, this compact and lightweight HOB protein skimmer from AquaMaxx has recently been improved. The larger capacity skimmer cup means it needs emptying less often, and a powerful submersible pump offers great performance. Although the physical construction of this skimmer has been improved, especially the hanger bracket, it still uses normal plumbing parts for the workings. It may be advisable to replace these with more durable aquatic parts before you set it up in your aquarium. You can find more details and the latest pricing of this 1.5 revision of the AquaMaxx HOB protein skimmer here. Our second product in this list from Reef Octopus has every right to be called a classic and it is a popular choice with many reef aquarium owners. It uses an Aquatrance 1000 pump, which is both reliable and powerful and does an efficient job of mixing water flow and bubbles. What makes this model particularly great is the pump is submerged in your tank rather than being on the outside. It may take up some space in the tank, but you won’t need too much clearance space on the outside. This is handy if your tank sits flush to or close to a wall. Dimensions: 8 x75 x 17 inches. Rated for aquariums up to 105 gallons. Submersible Aquatrance 1000-watt pinwheel pump. Won’t take up too much external space. Aquatrance pinwheel pump for plenty of diffusions. A surface skimming attachment is included and can be removed when needed. Can be a chore to clean, with most parts actually in the aquarium. Some of the acrylic parts can feel flimsy. If you have a larger aquarium, there are plenty of reasons this Classic 100-HOB from Reef Octopus is so popular. The fast-working pump system uses the powerful Aquatrance 1000 pump and an adjustable surface attachment allows for easier mounting. With a maximum rating of 105 gallons, this HOB protein skimmer should be suitable for most home aquariums. For more details on the Reef Octopus Classic HOB-100 and the latest prices, click here. What makes the Coral Vue BH-1000 so appealing to many is it doesn’t take up much space, either externally or inside the tank. The pump being under the skimmer means the external hanging skimmer doesn’t need as much horizontal space behind the tank, too. This is the ideal skimmer for those users who can’t have a sump or a standalone skimmer. The external pump also has the benefit of channeling heat away from your tank, a common problem that some other protein skimmers can have. The heat transfers to the outside air rather than the water, which means less chance of your aquarium overheating. Even better still, the powerful pump in the BH-1000 uses an easy removal system, so cleaning and maintenance are made much easier. With the 1000-watt external motor and a rating of up to 100 gallons, this is one of the most powerful protein skimmers on the market. Dimensions: 8 x5 x 17 inches. Rated up to 100-gallon capacity. A compact and low profile design. The powerful pump is reliable and easy to maintain. Uses an adjustable surface skimmer. An air silencer reduces the noise during operation. External pump for better heat transfer. Installation can be tricky with the poor instructions provided. The water container can be a bit small, especially when compared to its big brother, the Coral Vue BH-2000. The Coral Vue BH-1000 is the ideal HOB protein skimmer when space is at a premium, and you don’t want to mount a pump inside your tank. Temperature control of the aquarium can often be more difficult with a pump submerged in the water. If you have sensitive fish, you will need a more stable climate. With a 100-gallon capacity, this skimmer should suit most home aquariums, although the water tank is smaller than some other models. For the latest prices and more information, click here. Although we have mainly looked at models suitable for larger tanks, the Bubble Magus QQ1 is designed strictly for nano reef aquariums. This skimmer is rated for aquariums up to 25 gallons with heavy bioloads, although it could probably cope with slightly larger tanks if they have a lighter bioload. This smaller skimmer uses an efficient needle wheel impeller and a pump which forces the protein into a collection bin. The skimmer is very easy to adjust, and you can change the height of the collection bin for different foam qualities. A plastic thumbscrew holds the bin at the desired height, and the bin/cup is simple to remove for cleaning. Dimensions: 5.8 x4 x 10.5 inches. Rated for a tank up to 25 gallons. Easy to adjust, with an adjustable bin height and a diffuser included. Good turbulence levels and bubbles. Limited to tanks with glass less than half an inch thick. The plastic screw can crack if it is over-tightened. If your aquarium is a more modest size, up to 25 gallons, it will still need a protein skimmer. A small unit like this one from Bubble Magus will provide an inexpensive solution for keeping your water crystal clear and clean. This particular model is both easy to adjust and simple to maintain, too. For the latest prices and further details on this efficient and compact model particularly suited to smaller aquariums, click here. Hopefully, if you hadn’t already decided which HOB protein skimmer to buy for your aquarium, we have made your choice a little easier. A good protein skimmer can help keep the water crystal clear and free of contaminating proteins in any aquarium, especially in saltwater tanks. Healthy water means healthy plants and animals, and ultimately, less work for you. If you have any questions or would like to share any experiences or advice with us, we would love to hear from you in the comments below.